This is another of those written and published in a foreign country (South Africa) and then republished in another (UK) And then made it's way to our shores through the publishers importer. It does cover more of the craft end of metal foil and thin gauge work with pewter and using the leafing foils as accent touches. Since most on this forum are talented in more than one area. Or like to combined materials on occasion. Or even for the gifts, for those that really wouldn't like another widget form your shop! It covers everything from cards and book covers. To vases, light-switch covers, frames, glass objects and roses made from thicker material. Starting with a short introduction, material & tools, design & preparation to basic techniques. It covers the use of beeswax as a filler or backing of the design, it stay stable at most household temperatures. To using a lubrication on the metal tools used in the modeling of the designs in the pewter. One thing that has changed and improved the causal application of Patent Leaf(aluminum/sliver, brass/gold, copper, and pewter) is the development of the acrylic white/dries clear adhesives. For this application, makes using it for low dollar items more cost effective time wise. Rather than the mixing and application of shellac and then the time and testing till it is at the correct tackiness. 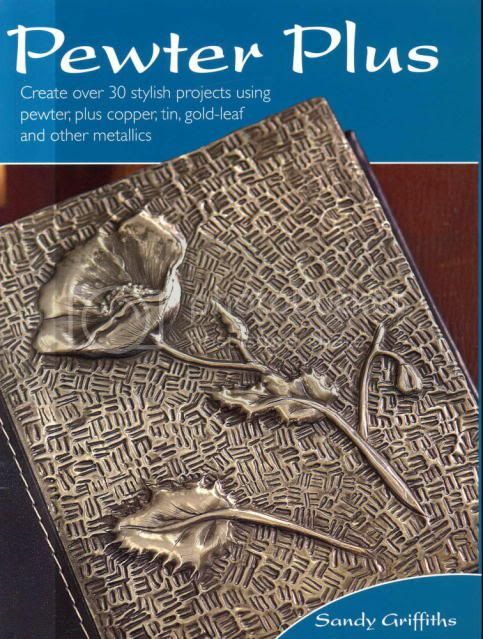 Since this is a cousin to Chasing & Repoussé, called by a number of different names tooling, modeling and embossing. The arts and crafts companies bring it out every couple of years. Most of the materials are available at the big box craft stores. Combining glass objects and the accent decorating techniques, along with metal work can give one a different perspective on their work. As in making frames for wall hangings or panels that can add to or enhance the art work. Glass containers decorated with a modeled pewter applique, the place in a metal work hanging frame or a wire form frame. The rose project will also work any number of petal type paper/silk flowers that can be taken apart for patterns. It also will work with the thinner gauges of copper, brass, stainless and aluminum sheet or extra heavy foils.